The city of Holmes Beach hosted its fourth annual Founder’s Day reception April 15 at city hall chambers. At the presentation, Mayor Rich Bohnenberger invited guests to share memories about the city’s history before recognizing some key members of the community. The vestibule contained a collection of photographs, articles and documents pertaining to Holmes Beach’s history. It also contained a table of breakfast rolls, fruit and juice, coffee and plenty of people to enjoy them as well as the proceedings. Guests were entertained by representatives of the Anna Maria Island Concert Chorus and Orchestra in the chambers, where Bohnenberger addressed guests, including city officials and other elected officeholders. He recognized the Community Emergency Response Team members present and added the agency to his honor roll of community partners. And he recognized descendents of Maud and John E. Holmes Sr., for whom the city was named some 61 years ago, including Betty, widow of the late John Holmes Jr., and Jean and Hugh Holmes Sr. and some of their children, grandchildren and at least one great-grandchild. He then invited guests to join him outdoors, where he proclaimed city hall to be officially named the John E. “Jack” Holmes Sr. City Hall. Vice Mayor Sandy Haas-Martens unveiled a bronze plaque bearing Holmes’ name as the mayor made his announcement. From there, the group enjoyed a few stories from the past and some guests returned indoors for tours or for a better look at the collection of photos, scrapbooks and documents on display. It specifies who attended the meeting of incorporation, names which voters cast votes for and against incorporation, and provides a detailed account of the discussion that took place. Robert E. Willis stated possible disadvantages to incorporating so small an area, namely, he said the loss of tax money derived from the sale of cigarettes and liquor and a possible withdrawal of assistance by the county for the maintenance of roads and streets. There was some discussion of incorporating the entire Island as a whole, and Willis believed this could be accomplished in 30 days. “In both cases we would be out voted and the only solution [Miller] could see is to support the large property owners in the area under consideration for incorporation at this time, since these owners are desirous of properly zoning their land and protecting all of us in the area,” Miller said. Miller, according to the transcript, felt that a house of 500 square feet and lots only 40 feet wide were inadequate and that with building restrictions, codes and zoning, people would have larger, better and more comfortable homes and that the insurance companies and mortgage loaning agencies would then be willing to loan money to finance the construction of new homes and help build the Island up faster. Both Miller and J.E. 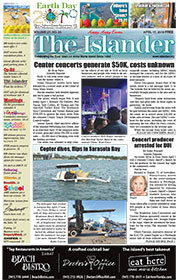 Holmes Sr. stated that everyone was working for the same result, the incorporation of the Island as a whole, but there was a question in the minds of many if Bradenton Beach would incorporate the Island as a whole by March 20, and it was felt the action scheduled for the present meeting should be placed before voters. After much discussion it was determined that the question of incorporating the Island as a whole had been under consideration for a number of years with nothing being done about it, and the question of incorporating as the 600 acres area described in the legal notice was put to a vote. According to the minutes, 46 voters were in favor, 13 voted against and one person abstained. Oscar Russell and Miller thought that no person’s name should be used for the naming of the town. Other suggestions included: Palm City, Mid-Island Beach, Coquina Beach and Tarpon Beach. Among all the suggested names, voters selected Holmes Beach by a narrow two-vote margin over Coquina Beach, not enough for a clear majority. With such a narrow margin, voters cast again just between the names Coquina Beach and Holmes Beach. In the second round of voting, Holmes Beach won by 15 votes. The final business conducted at the meeting of incorporation was the election of Halsey T. Tichenor Jr. as mayor and R. Maxwell Ingham, Frank Giles, John R. Miller Jr., Oscar Russell and John E. Holmes Jr. as alderman. Clifton Walker was named town clerk and Louis Meyer was elected as marshal. And, so began the city of Holmes Beach. The mayor and alderman met the first and third Tuesdays of the month either at the home of the mayor or the town clerk throughout April and May of 1950. By June 6, John E. Holmes had added an office in the Holmes Supply Building, which the alderman unanimously agreed to permit for use by the town clerk and for the town’s regular meetings. The documents enacted by the city’s governing boards from 1950-1955 are on display throughout the month at city hall.